Home » Our Doctors » Chad Robeck, O.D. 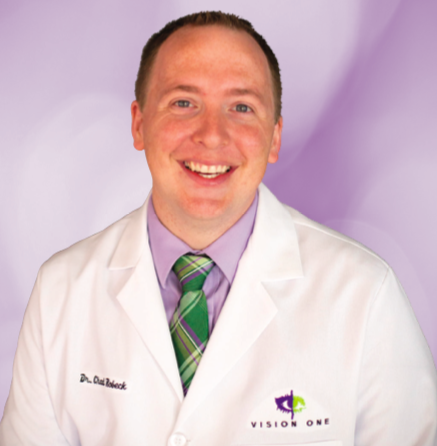 Dr. Chad Robeck is our newest optometrist at Vision One. He received his doctorate of optometry from the University of Alabama at Birmingham School of Optometry in 2018 and was a recipient of a merit scholarship while attending school, as well as a number of other accolades, including being on the Dean’s List of Honors. He is a member of the Kentucky Optometric Association and the American Academy of Optometry. Dr. Robeck strives to develop meaningful relationships with his patients because he realizes he is treating a person – not just an individual’s eyes. He decided to become an optometrist after witnessing the impact of cataract surgery on his father. After seeing how this experience positively impacted his father’s quality of life, Dr. Robeck realized that, as a child, he took his vision for granted. He realized that he wanted to help people whose vision had been compromised in some capacity regain – to the greatest extent possible – the vision that they once enjoyed, and to help others with good vision maintain a healthy lifestyle to preserve their vision as long as possible. Outside of work, Dr. Robeck enjoys spending time with his wife and three children. He also enjoys playing the piano, traveling, cooking, trying new foods, and exploring the great outdoors. He is fluent in Spanish and spent some time in Argentina, where he learned to speak the language, while he served a mission for his church. He was born in Washington State, but his wife is a native of Northern Kentucky, so he came here (willingly) and is proud to call Kentucky home.